Modular-Lab Standard is the ideal solution for your lab focusing on research and development of new radiopharmaceuticals. This versatile and flexible radiosynthesis device enables custom synthesis processes to be assembled from a set of unit operation modules adhering to GAMP 5 and Part 11 requirements. The small, sealed, stainless steel modules are stacked and connected by process tubing and by a single electrical cable. 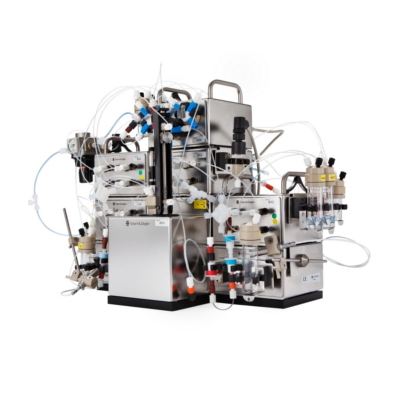 As the first system of the Modular-Lab family, Modular-Lab Standard has been specifically designed to allow versatile radiochemical development and production. The system enables custom synthesis processes to be assembled from a set of unit operation modules. The use of multiple, replaceable modules allow Modular-Lab Standard to be used for various isotopes and many types of reactions. Due to its multifunctionality Modular-Lab Standard can replace several single-purpose devices, which significantly reduces cost and lab space. The included Modular-Lab software provides an intuitive graphical interface, used to design and control the synthesis process. Modular-Lab Standard’s unique modular approach combines the speed and safety of a remote, fully automated system with the flexibility to configure syntheses for novel tracers. Cleaning and sanitation routines can be programmed to take place between runs or overnight. With this multifunctionality, Modular-Lab Standard supports research as well as routine production. Disposable components such as valves, tubing, cartridges and others are standard, off-the-shelf units and can be exchanged as needed for different applications. Modular-Lab Standard can be applied to a wide range of compounds and isotopes. The modules can be arranged to fit even very small hot cells. 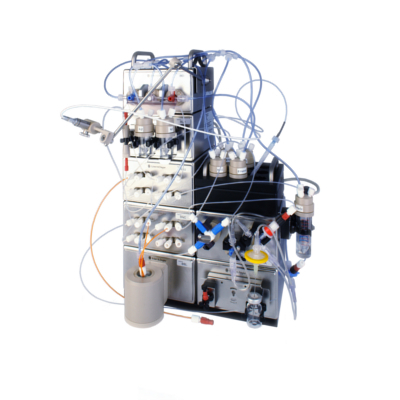 Available modules include a Peltier/Heater reaction system with solid-state temperature control from -20 °C to +150 °C/ 220 °C, a wide variety of valve modules, instruments for temperature, pressure and radiation detection, a compact semi-preparative HPLC module, analytical HPLC, TLC modules, and many others. The intuitive user interface is easy to program by drag and drop of graphical symbols and adheres to today’s regulatory requirements. Parameters such as temperature, activity, UV detector readings, flow rates, or valve settings can be monitored easily in one window. Reports containing all relevant data and information are created automatically after each run. Reliable, automated synthesis with remote monitoring provided as necessary through the graphical computer interface, eliminates the need for hands-on operation and significantly reduces radiation exposure to lab personnel. We offer a variety of chemical reactions including customized synthesis processes according to your needs, e.g. [18F]FEC, [18F]FDG, [18F]Fluoroethyltyrosine, [18F]Flumazenil, [18F]MISO, [11C]Choline, [11C]Methyl Iodide, [131I]MIBG, 68Ga-DOTA peptides, 64Cu applications, customized syntheses. 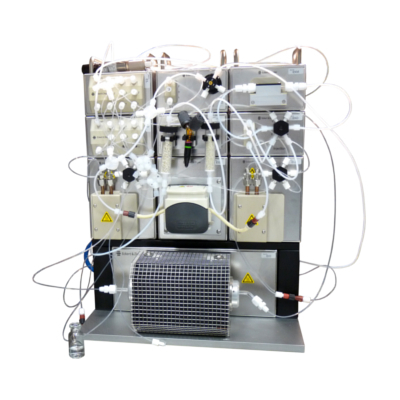 Eckert & Ziegler Radiopharma also offers the cassette-based Modular-Lab PharmTracer and Modular-Lab eazy, which are suitable for GMP-compliant routine production of a large variety of radiotracers. In addition KitLab is our solution for stand-alone cold kit labeling and more.